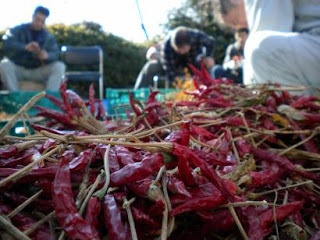 This post first appeared in April, 2009, a little more than a month after we arrived in Japan and I started at the farm. While showing a friend around Tokyo's Earth Day Market recently, our conversation turned on the relevance of such markets (it's all organic and fair trade as well as predominantly local) and farmers and why I believe in them so much. And then I remembered this post where I first started tracing some of the thoughts and resulting steps that brought me to where I am now. It's a bit long and a bit rough (early writing, you know), but it still conveys what I feel nearly three years later. Photo Note: Taken at the farm last year during a workday project sorting togarashi (Japanese hot peppers) for distribution to area restaurants and shops. As I work along at a local organic farm planting epic numbers of vegetables - 5,000 cabbage one week and 1,000 broccoli the next - or spreading what feels like endless amounts of manure on fields for eggplant and zucchini, something my friend Amber once said keeps coming back to me. “This” referred both to the branch she was cutting and to her work at Ambry Farms. Farming is no easy task in general, but at Ambry they combine horses and tractors to get the job done. One challenge is to find which tasks are better done with what, and then figure out how to do them best. The other challenges (farming has a long list) include fixing whatever is broken, damaged, or so neglected that it takes your whole soul to recognize the flicker of life still lurking in the horse-drawn planter or hay rake. And it can take your whole soul to have faith that that flicker of life is strong enough to be revived. But then, I thought about it. I was tired of the commute (45 minutes one way, door to door), and I was becoming tired of the work. The thought of organizing one more event, large or small, made me feel sick to my stomach. It didn't feel right any more. Yes, it was helpful, and yes, it made a difference in the lives of individuals and for the community at large, and yes, I worked with fantastic people not only in my office but all across the city and county. But I was drained. Luckily, two things were in place. One, we pretty much knew we were moving to Japan the following year. A job was in the works, and we felt it was more than a safe bet that it would be offered. Two, some good friends with an organic farm about two miles away from our home generously offered to make me part of their crew for the summer. Another dream job was about to unfold. Now in Tokyo slinging assorted manures and planting seedling after seedling, Amber's words run through my mind again and again. My arms turn to jelly and my back is sore. I'm sweating like mad while I make sure I've evenly spread the manure or gotten the seedling planted deep to where there is some moisture in the soil. I imagine the eggplants settling into their new home and feasting on what they find to create glossy fruits. I tally the components and wonder what other farmers use, and how their plants will compare. The steps seem so simple – set out the seedlings, crouch to plant, gently press, or spread this then that amount evenly over the field – but behind me and with me is all of the planning and experimentation of multiple generations. New items and strategies and some that are age old. I am lost in the meditation of it all, but simultaneously present for each seedling and toss of manure. My whole body and mind are engaged in this effort from the tips of my gloved fingers to my toes where soil, as usual, has snuck into my shoe. I come home at the end of the day bone tired, sore, and dirty, but so incredibly happy. It is the joy of a job well done and the good companionship of the farmers. It is the excitement of learning, laughing and working together, and seeing all those plants happily waving back at me from their new home in the field. And I think of the broccoli and cabbage that will come, and how that will feed so many so well, and my joy is nearly inexpressible. Birds hop about, a cat trots across the field, and bugs hum in the trees nearby. What aching back? I'm so glad you reposted this- I had never seen it the first time around and it gives so much background that I didn't know. What a beautifully written post. Sorry I've been MIA- been so busy- am hoping to catch up on blog posts in the days ahead. Hope you have a great New Year!! Woh, Joan, so there's the backstory! Interesting indeed, not to mention courageous. Empathise with the love of *real* "fieldwork" and hope you're still good with the parents! All the best to your good self, and wishing you all the very best (and forgotton aching backs) through the next year. No worries, Anjuli! Goodness knows life is full of great things to do. I'm just glad to see you when you have a moment to pop around. Hope the holidays are treating you well! Thanks, too, Tom, for the good wishes. A back story indeed - past as well as 'koshi' - that still inspires. Stop out again when you get a chance. Or we can meet up in January! I'd love to see the article, too, when you get a chance. I think the farmers would love it. Tom! Wrong Tom! Drat. Well, I do think the farmers would love your blog. Everything else holds true still, though. Need to check back about your orchard!! Still quite excited about that.